Athlete’s Foot, medically known as Tinea Pedis is a skin infection caused by the Trichophyton fungi. Athlete’s foot occurs when he/she comes in contact with the fungus present on damp contaminated surfaces such as floors of public showers or gyms. This fungus grows best in warm and moist areas of the body and the feet; especially the space between the toes is the perfect place for them to multiply. Athlete’s Foot is a highly contagious skin condition but susceptibility to this condition increases with age. One of the main problems with Athlete’s Foot fungi is that it can remain dormant underneath the skin for weeks and months and the infection can keep returning for years. Instead of resorting on the antifungal creams, you can try natural remedies to treat athlete’s foot like tea tree oil . 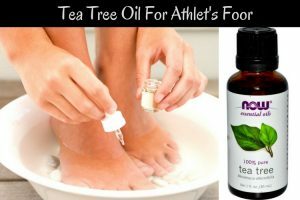 Is Tea Tree Oil Useful for Treating Athlete’s Foot? The active ingredients terpene hydrocarbons, monoterpenes and sesquiterpenes present in tea tree oil destroy harmful bacteria and fungi. It has potent antiseptic properties that disinfects the affected area of the foot and prevents the fungal infection from spreading to other parts of the body. Being an astringent, it reduces redness and pain of the infected tissues and speeds up the healing process of the infection. The anti-inflammatory properties of tea tree oil soothe and heal skin inflammation and burning sensation associated with Athlete’s foot. In most of these remedies tea tree oil is used in either diluted form alone or in combination with other natural ingredients as a treatment for athlete’s foot. Tea tree oil can be used directly or in diluted form mixed as a natural cure for athlete’s foot. Add a few drops of tea tree oil to a piece of cotton or linen. Place it between your toes or on the affected area. Press the piece of cotton against the infection and let the skin absorb the oil. Wait for 30 minutes and then discard the piece of cotton or linen. Repeat this remedy 2 to 3 times a day till the infection heals. Note – This remedy makes use of undiluted tea tree oil and is not suitable for people with sensitive skin. This process not treats athlete’s foot but also helps in providing relaxed and rejuvenated feel to the feet. Partly fill a foot bath or shallow tub with lukewarm water. Add 10 to 15 drops of tea tree oil to it and stir well to disperse the oil. Soak your feet for 15 to 20 minutes and then dry your feet using a towel. The medium-chain fatty acids (lauric acid and capric acid) in coconut oil disrupts the fungal cell membranes and help to treat recurrent, drug-resistant fungal infections such as Athlete’s Foot. Take 4 tablespoons of extra virgin coconut oil and add 10 drops of tea tree essential oil to it. Take generous amounts of this oil mixture on your palms and rub it onto your feet. Apply it generously between the toes and on the affected areas. You can repeat this remedy 2 times in a day. The antifungal and antimicrobial properties of olive oil kill the infection-causing fungus and prevent it from spreading to other parts of the foot. Add 5 to 6 drops of tea tee oil to 2 tablespoons of extra virgin olive oil. Soak a cotton ball in this mixture and use it to wipe your feet thoroughly, especially in between the toes and the affected areas. Wash your feet with soap and water. Pat dry with a towel. Follow this process 2 to 3 times a day till the infection cures completely. The potent anti-inflammatory properties of apple cider vinegar relieve inflammation and pain while its highly acidic nature kills the fungus that cause athlete’s foot. Add 1/2 cup each of apple cider vinegar and water in a bowl. Add 10 drops of tea tree oil to it and give it a stir. Dip a clean wash cloth in this solution, use the wet cloth to wipe in between your toes and then wrap it around your feet. Wait for 20 to 30 minutes, discard the wash cloth and wash your feet with water. Repeat the process twice a day for a few weeks. Note – Try to use unrefined, organic apple cider vinegar to maximize for effective results. The powerful antiseptic and anti-fungal properties of lavender essential oil destroy the fungi responsible for Athlete’s Foot and other nail infections. It also disinfects the affected area and prevents the infection from spreading. Partly fill a shallow tub with water. Add 10 drops each of tea tree essential oil and lavender essential oil into it. Stir the water using your hands and soak your feet in this water for 20 to 30 minutes. Dry your feet using a clean towel. Follow this process at least once in a day. The anti-inflammatory properties of pure aloe vera gel soothes inflammation, redness and pain associated with the infection. A specific type of protein in aloe vera prevents the fungus from spreading to other parts of the foot. Take 2 tablespoons of fresh aloe vera gel in a bowl and add 5 to 8 drops of tea tree oil to it. Give it a nice stir using a spoon and apply a thick layer of this ointment over the affected areas of the feet and in between the toes. Pat your feet dry using a towel. Reapply this ointment several times a day for few days. Cinnamaldehyde, the main active component in cinnamon has potent antibacterial and antifungal properties which help to fight fungal infection. Its anti-inflammatory properties help to heal inflammation, pain and discomfort associated with athlete’s foot. Break 8 to 10 cinnamon sticks and add it to the boiling water. Continue to boil for another 5 minutes. Let the cinnamon tea steep for 30 minutes. Now, add 10 drops of tea tree oil to it and soak your feet in it for 15 to 20 minutes. Repeat this treatment once daily until the infection is completely healed. Baking soda neutralizes the pH level of the skin. It helps to soak moisture from the feet which in turn creates a hostile environment for the fungi that causes athlete’s foot. Combine 2 tablespoons of baking soda and water to make a thick paste. Add 5 to 6 drops of tea tree oil to it and mix well. Apply this paste all over the feet and in between the toes. Let it dry on its own and then wash your feet with water. Follow this remedy 2 times a day for several weeks. The antibacterial and antifungal properties of lemon juices kill the fungi responsible for athlete’s foot. Its astringent properties dry out excess moisture from the feet and control the infection from spreading any further. Add the juice of two freshly squeezed lemons to 1/2 cup of water. Add 5 to 8 drops of tea tree oil to it and give it a stir. Dip a cotton pad in this solution and wipe your feet with it. Don’t forget to wipe between the toes. Repeat this treatment 2 to 3 times a day for a few weeks. Note – Lemon juice can cause a stinging and burning sensation in the infected regions of the foot but it won’t cause any harm and subside after some time. Quercetin found in onion has powerful anti-inflammatory and antioxidant properties that help to relieve inflammation and heal the fungal infection. Chop a medium sized onion and put it in the grinder to make a smooth paste. Add 3 to 5 drops of tea tree oil to it and stir it using a spoon. Apply this poultice generously over the affected areas of the foot. Wash your foot with lukewarm water and pat dry with a towel. Follow this treatment 1 to 2 times a day for a few weeks. Tea tree oil should always be used in diluted form. Undiluted tea tree essential oil is too strong for the skin and can cause contact dermatitis, irritation, burning and redness of skin. Diluted tea tree oil doesn’t cause any side effects in most cases, but it may cause a reaction if a person has excessively sensitive skin. It is always a good idea to perform a small skin patch test on your arm or leg to ensure your skin does not react adversely to tea tree oil before applying it. Tea tree oil provides a cooling sensation to the skin but it can cause slight burning if applied in excessive quantity. Tea tree oil is not safe for internal use and it can be poisonous if swallowed. It should never be ingested by mouth for any treatment. When using tea tree oil for remedies, always use 100% pure essential oil that does not contain any fillers or solvents to make the most of its therapeutic properties. Store your tea tree essential oil in a cool, dark and dry place because light, heat and air exposure affects the stability of essential oils. Wear cotton socks and wash your socks after every wear. Avoid nylon socks at all cost. Wear flip-flops or sandals when walking around pools, gyms, showers and locker areas. Wash your feet every day with soap and water and dry them completely after washing. Alternate your shoes each day to ensure that your shoes are perfectly dry when you put them on. Get rid of stubborn fungal infections and prevent the recurrence of Athlete’s Foot with these natural remedies using tea tree essential oil. Do you know any effective remedy for athlete’s foot using tea tree oil? Then share it with us in the comments section below. The sides of my ankles have itchy rash on them. I do have athletes foot. I tried lots of products and doctors. I need relief from around my ankles. Last resort I am rubbing castor oil on the rashes. Any suggestions..Need help! !